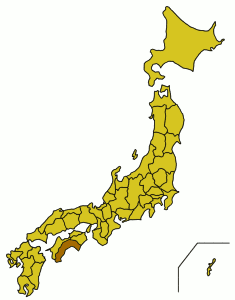 Kōchi Prefecture (高知県 Kochi-ken ) is on the Japanese island of Shikoku. The largest of the four prefectures on Shikoku, it has a relatively small population, with the Prefectural Capital of Kochi City having approximately 300,000 people. Primarily mountainous, the primarily agricultural populace cope with the use of terraced rice paddies, and other fields. Due to the southern location within Japan, there are areas in Kochi that are able to harvest rice multiple times a year, a valuable extra source of income for the region. Kochi was formerly known as Tosa (土佐). A number of important figures in Japanese history and culture hail from Kochi, including Tomitaro Makino and, most notably, Sakamoto Ryoma. A major figure in the Meiji Restoration, Ryoma's image can be found all over Kochi and even Nagasaki, and you can visit his birthplace in the central city, as well as other sites to do with his life. Pint-sized Kōchi Ryōma Airport (IATA: KCZ)  has flights to Osaka-Itami, Osaka-Kansai, Tokyo-Haneda, Nagoya-Komaki and Naha (Okinawa). Buses to/from Kochi station (35-45 min, ¥720) leaves roughly twice an hour. Many residents flying to other major centres in Japan find it cheaper to first travel by bus to Matsuyama in neighbouring Ehime, before then flying to other destinations. When booking flights, it may be worth checking this option to save some money. The most popular way to arrive in Kochi by train is from Okayama, which is on the main island of Honshu. From Okayama take the Limited Express Nanpu train, and you will arrive in Kochi in approximately 2.5 hours. While this may seem like a joke for such a far out area of Japan, Kochi is on Shikoku Island. A nationally renowned pilgrimage route runs through all 4 prefectures on the island, The 88 Temple Pilgrimage, or, Henro. This pilgrimage encompasses a visit to 88 sacred temples throughout Shikoku, 16 of which are in Kochi prefecture. Despite having only 18% of the temples on the route, over 35% of the total length runs through Kochi, many of it mountainous. As such, many Japanese visitors (and the occasional foreigner) to Kochi enter from Tokushima while on this pilgrimage. There are car rental stores at Kochi, Nakamura and Susaki and Aki train stations, as well as at the airport. Kochi roads can be long, narrow and winding, the drivers careless and signs difficult to understand without knowing Japanese, but driving is the best way to see most of the far flung sites throughout Kochi. There is an expressway running down from Otoyo town, on the northern border, passing through Kochi city and heading down towards Susaki. The Otoyo-Susaki section (as well as the road into Tokushima to the north of Otoyo) is a toll road. From Susakinishi to Shimantocho (Kubokawa) the expressway is toll free, but narrows to one lane in some parts with a slightly reduced speed limit. Construction is underway to extend this as far as Shimanto city. There is also a short stretch of toll-free expressway from Shimanto-shi to Sukumo. Even on the new Gomen-Nahari line, trains are few and far between, and do not always connect to buses and tourist sites very well. If you are in Shikoku for a while, or even making one return train journey it's worth getting a Young Weekend discount card from JR. The card costs ￥1000 for a year and gives a discount of up to 40% on return journeys made on a single weekend. The card is only available for passengers 29 years and younger. Look out for the 'anpanman trains' they're just regular trains but they're painted throughout with the characters from the popular anime 'anpanman'. They are usually running the Ashizuri express to Shimanto from Kochi. The JR Shikoku website has a lot of information (in Japanese) on trains in Shikoku, as well as connecting buses, airport buses, hotels and tourist attractions. See . Aside from the Kochi specific tourist activites such as Harimaya Bridge and Katsurahama, many activities are not conveniently located for tourists, and as such require a car to get to. There are however lots of options for anyone looking for less touristy activites, which take advantage more of Kochi's natural gifts. The Yoshino river that runs through northern Kochi hosts several water rafting companies. Agawa Sky Park in Niyodogawa offers Paragliding and Hanggliding lessons, as well as hosting more experienced participants. There are several blacksmiths scattered throughout the smaller, further out regions, where you can go as a small group and smith your own kitchen knives in the traditional Japanese style. As these are further into the countryside, access to a car and someone with knowledge of the area and Japanese is useful to have. The local specialty is katsuo no tataki, bonito quickly seared under high heat so the surface is cooked while the inside is still raw. The preparation of this dish, with the open heat source and the traditional hay fuel source, is in itself a tourtist attraction and can be seen at any number of popular Katsuo restaurants. Liquor in all forms: the people of Kochi are known as the biggest drinkers in Japan. The women in Kochi are particularly renowned for their affinity and ability to drink. They are referred to as Hachikin, literally meaning 8 testicles since it is said that one Tosa (Kochi) woman can drink like four ordinary men. Kochi offers an abundance of locally made sake and shochu, and the friendly locals will surely approach you for a fun interaction at Kochi`s numerous bars. 17 sake breweries in Kochi make Tosa Space Sake (土佐宇宙酒 Tosa uchūshu), prepared with yeast that was taken into space for ten days and back aboard a Soyuz rocket in 2005, so be sure to sample some for a taste experience that is out of this world. Alternatively, try to track down some space yogurt (宇宙を旅したヨーグルト Uchū wo tabi shita yōguruto, lit. "The yogurt that traveled in space") , prepared from the same yeast. For many, especially those with easy access to the central city, a night out will often start at Hirome Ichiba. Located less than five minutes walk from Kochi station, and the main shopping arcade of Obiyamachi, this multicultural food court is unique even in Japan. The indoor night market feel, with the abundance of different cuisines and drinking options make it a favourite for tourists and residents alike. A large space with communal tables, it is an ideal venue for a large group to meet, and even travelling alone there are always plenty of people who may try to start a friendly conversation over a drink. A great place to try many local foods and beverages, right in the heart of the city, before heading out to one of the many karaoke bars in town!